Shoulder pain is a common complaint and physical therapy may be recommended as a treatment or as rehabilitation after surgery. Learn about the types of therapy done for different conditions that produce shoulder pain. The shoulder is a complex ball and socket joint that is made up of the humerus (arm bone), the scapula (shoulder blade) and the clavicle (collarbone). There are many ligaments that help support the shoulder, and many muscular attachments help move the shoulder. The shoulder is an extremely mobile joint, allowing people to reach and move in many directions. Rotator Cuff Tendonitis: The rotator cuff is a group of four muscles that help support and move the shoulder. Their primary role is to help hold the ball of the arm bone in the socket while the arm is moved. The rotator cuff tendons attach to the arm bone in an area that lies directly underneath a bony prominence of the shoulder blade. The tendons can get pinched underneath this bone and become inflamed and sore. Biceps Tendonitis: The biceps tendon attaches your biceps muscle in your upper arm to the front of the shoulder. Many people consider the long head of the biceps tendon to act as a fifth rotator cuff tendon, offering stability to the front of the shoulder. This tendon can get pinched by the bony anatomy of the shoulder blade or by ligaments that attach to the collarbone and shoulder blade, causing tendonitis. Shoulder Bursitis: A bursa is a fluid-filled sac that helps body structures glide smoothly over one another. There is a bursa that lies between the humerus bone and the shoulder blade. This bursa can be pinched in the shoulder, leading to pain. Frozen Shoulder: Frozen shoulder, or adhesive capsulitis, is a condition where the shoulder becomes painful and gradually loses motion. This loss of motion can last for up to 18 months; it can be painful and lead to a significant functional loss. Shoulder Fracture: A shoulder fracture occurs after significant trauma. Falling on an outstretched arm is a common cause of a shoulder fracture. The collarbone, scapula, humerus, or a combination of all three may be injured as a result. If you have developed shoulder pain as a result of trauma like a fall or a car accident, you should seek medical attention immediately. Also, if your shoulder pain has lasted for more than two to three weeks and is accompanied by significant functional loss, a visit to your doctor, physical therapist, or another healthcare provider is recommended. Initially, a short period of rest is recommended for shoulder pain. This should last two to three days. During this period, you can apply ice to the shoulder to help control inflammation and provide symptomatic relief. Ice can be applied for 15 to 20 minutes. You can also start gentle pendulum exercises during this time. By keeping the shoulder mobile, you can avoid a frozen shoulder. After a few days of rest, shoulder exercises can be started to help improve the range of motion of the joint and improve the strength of the rotator cuff muscles. As stated earlier, the rotator cuff helps stabilize the ball in the socket when you lift your arm, so strength here is important. A visit to your physical therapist to help evaluate and treat your shoulder pain may be necessary. Your program will likely start with an initial evaluation. During this assessment, the therapist will ask you questions about the nature of your pain and the aggravating and relieving factors. He or she may use a goniometer to take measurements of the range of motion and strength of the shoulder, and monitor the quality of your shoulder motion. Then, special tests for the shoulder may be performed to help determine which structure is causing your pain to help guide treatment. After the initial evaluation, treatment can begin. Your therapist will choose therapeutic modalities to help control pain or inflammation. You may be instructed to perform a home exercise program to help improve the strength and mobility of your shoulder. It is important to follow your physical therapist's advice and instructions closely. Ask questions if you have any. Typically, shoulder pain lasts about four to eight weeks. After a few weeks of treatment, you should notice an improvement in your condition. If you continue to have shoulder pain, you may need to see a specialist. He or she may offer more invasive treatments such as injections or surgery to help treat your shoulder pain. If you need an injection in the shoulder, physical therapy after the injection can help determine the cause of the pain and help avoid future problems. If you do require surgery, follow your surgeon's directions closely to protect the shoulder. 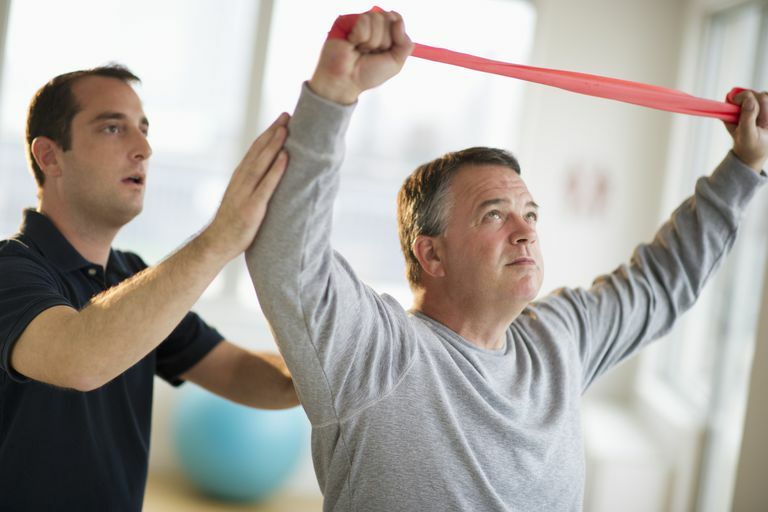 Post-operative physical therapy can help regain normal motion and strength after your surgery. You use your shoulders in many types of motion, but they are prone to injury. Appropriate rehab after an injury will help keep your shoulder joint mobile and strong.